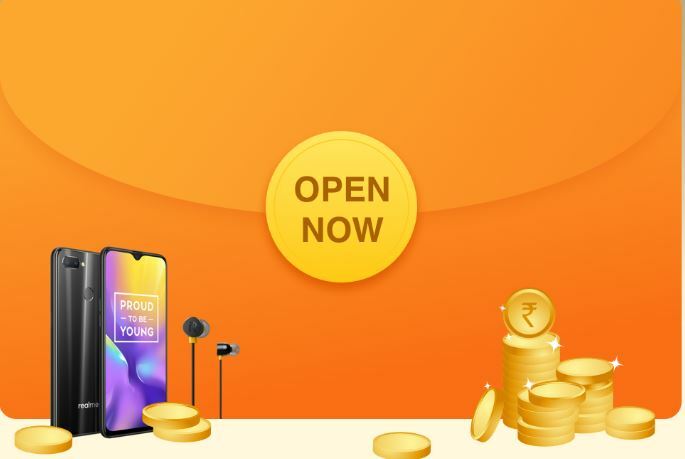 Realme Republic Lucky Bag , Realme Republic Day Sale , Realme Republic Lucky Bag Price Drop – Hi Guys , Here Comes Another Contest From Realme & That is Realme Republic Lucky Days Bag Contest. This Contest Is Same Like Price Drop Contests, Which We Have Posted Here. User Have to Drop The Price By Clicking On Bag Symbol. There are 5 Free Realme U1 Devices & Free 100 realme Earbuds Are Up For Grab. Also You Can Drop The Price & Get The Discounted Coupons From This Contest. 6. You can increase Your wallet amount by sharing the lucky bag to Your friends. 9. When You opens Realpublic Lucky Bags, there is a chance to win free Realme U1 and Realme Buds. 10. So , Why U Waiting For ? Just Click Your “Share To Win More” Button & Copy Link & Start Sharing !! 11. Enjoy !! & Have A Best Luck !! 1. Activity schedule: 18th to 20th Jan, 2019. 2. Participants need to login to or register Realme account to take part in this activity. 3. Every participant gets ₹100 in his/her Realpublic Lucky Bag on registering/logging in for the first time. 4. Paticipants can increase their wallet amount by sharing the lucky bag to friends. Wallet Amount will increase by a random value between ₹5 and ₹50 on each Realpublic Lucky Bag opening. The maximum limit for wallet amount is ₹1000. 5. Your friends can also get their wallet amount increased randomly between ₹5 and ₹50 on opening the Realpublic lucky bag post registration/logging in. 6. Every participant can open 5 Realpublic Lucky Bag per day. Once reaching this limit, participants can still help others open Lucky Bag but won’t be able to get their own wallet amount increased. 5. When participants open Realpublic Lucky Bag, there is a chance to win free Realme U1 and Realme Buds. 6. All participants can redeem coupon codes with wallet amount in activity page and place their orders using coupon codes to buy Realme U1, Realme 2 Pro, Realme C1, Realme 2 on realme.com. 7. Order Value below ₹500 will be charged shipping fee on realme.com. 8. All participants will get a Realpublic Hero Medal in Realme Community, please check it on 21st Jan at https://c.realme.com/in/ . 10. Coupon codes are valid till 12AM, 1st Feb, 2019. 11. 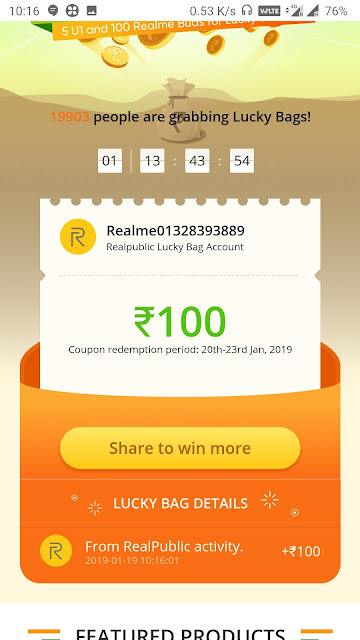 Realme reserves the right to disqualify participants who do not adhere to rules of the “Win Realpublic Lucky Bag” activity.